Yosemite West is home to some of the most beautiful views and best accomodations in the park. Starting in 1912, the area was actually used for logging, but the logging operations in the area have long since been shut down. The trees that have grown back now reach over 80 feet tall in some areas. One interesting remnant from those logging years is the remains of the longest incline rail system ever built, which stretched across the Merced River to a height of 3,100 feet. Yosemite West is a private community that is located just off of Wawona Road. Inside of Yosemite West, you will find numerous homes, cabins and condominiums that are nestled in the southern region of Yosemite National Park. Some of these homes are owned exclusively by permanent residents and others are owned by resorts, like Yosemite's Scenic Wonders, that specialize in Yosemite West rentals. While Yosemite West is comprised of numerous residences and resorts today, this area really did not become a real estate hot spot until 1967. Hundreds of years before 1967, Yosemite West was occupied by North American Indian tribes. These tribes literally lived off the land through hunting and fishing. In fact, their influence is still present. If you look hard enough while lodging in Yosemite West, you may discover an obsidian chip - which is technically an Indian arrowhead. There is no doubt that Yosemite West is beyond majestic. This jewel of Yosemite combines history with amazing scenery. Additionally, this private community is close to several popular tourist destinations, including: Half Dome, Yosemite Falls, Badger Pass, Mariposa Grove (home of the Giant Sequoias) and countless hiking trails. There is no shortage of sights to see or things to do in Yosemite West, which is why many vacationers choose to stay inside of this convenient community. Getting to Yosemite West is quite easy. Simply take Highway 41, which runs through Fresno County. While driving on Highway 41, you will pass sites like Mariposa Grove. 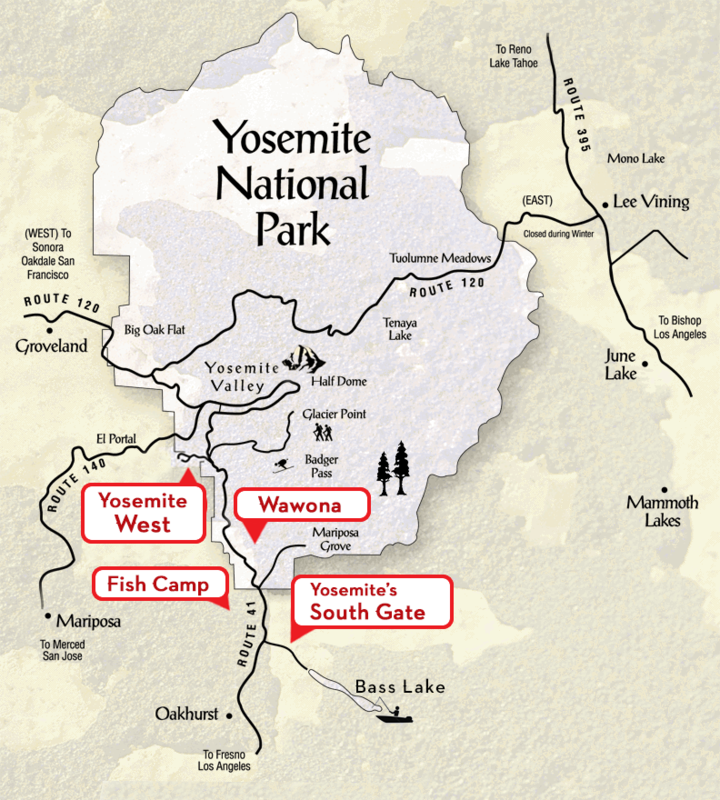 This route will take you directly to the South entrance of Yosemite National Park. People who are planning to visit Yosemite National Park will appreciate the convenience and location that Yosemite West has to offer. Aside from being close to most attractions, Yosemite West is absolutely breathtaking. Visitors who are looking for Yosemite West lodging should give Yosemite's Scenic Wonders a call. Yosemite's Scenic Wonders is located within the gates of Yosemite National Park in exclusive Yosemite West. At Yosemite's Scenic Wonders, vacationers can choose from a variety of rental homes, condominiums and cabins. Whatever your needs may be, Scenic Wonders' location and affordability cannot be beat! Are you looking for Yosemite West rentals? Call 1-888-YOSEMITE (1-888-967-3648) or make your reservation online today!